Get a real-time view of your cashflow. Log in anytime, anywhere on your Mac, PC, tablet of phone to get a real-time view of your cash flow. Run your business on the go. Use the mobile app to reconcile, send invoices, or create expense claims - from anywhere. Try Xero Accounting Software for free. 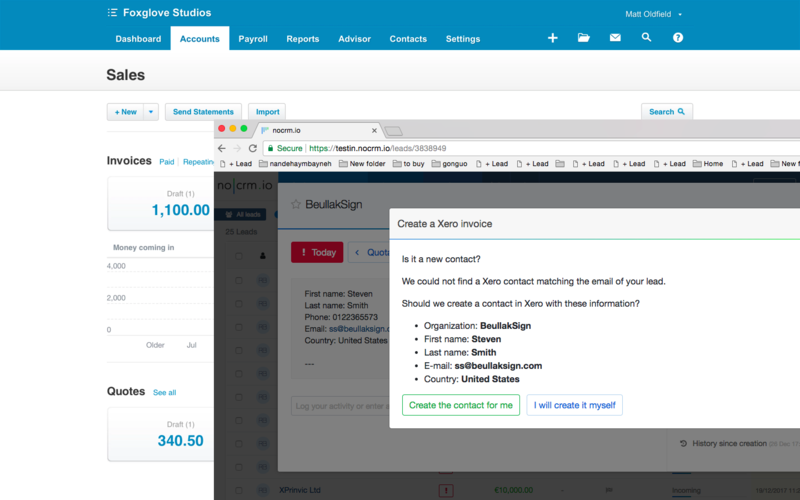 Create Xero invoices and quotes from no CRM.io with one click. Lead information is automatically pushed to Xero to avoid manual entry. Attach Xero invoices to leads in no CRM.io and automatically change lead status to WON with updated deal amount. Learn more about getting started with no CRM.io and Xero here. Don’t drop important leads and close more deals! Try no CRM.io for free if you don't have an account yet! Login to your noCRM.io account and go to the Admin Panel to select Xero. Click on Connect my Xero account and enter your credentials to enhance your sales teams’ workflow. For more information on what you can do with our Xero integration, visit our help page here.